Starting the Freight House build. 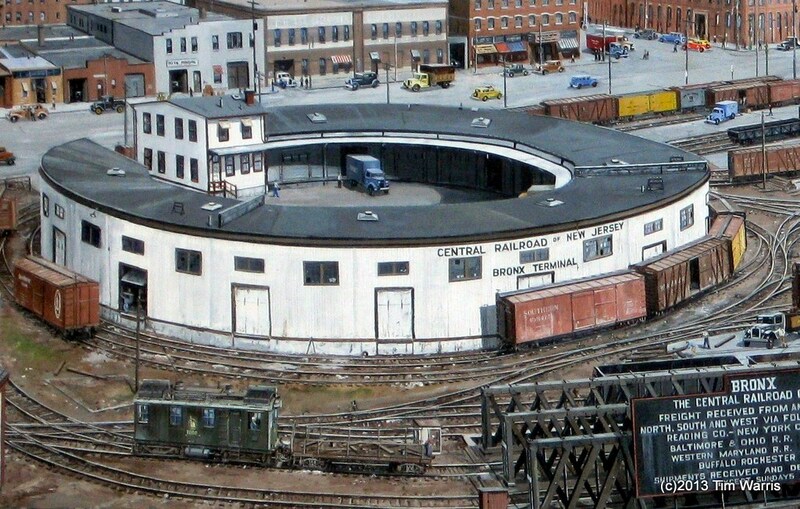 Next up in the construction of the layout is a project I have been putting off for some time, the “round” freight house. Not really round, its a 29 side nightmare. Some time back, I designed and built a completely accurate mock up of what will become a detailed model of the freight house. 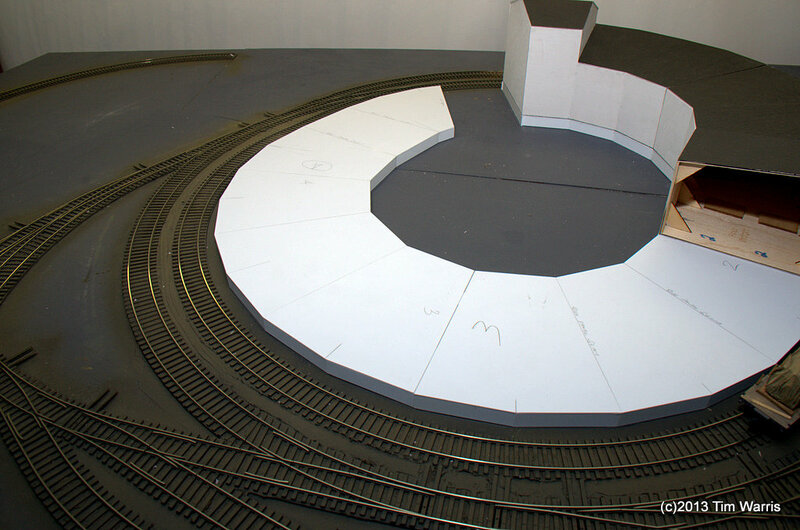 I did this so when the layout is on display people could envision what sat inside the concentric ovals of the layout. I also did it to use when building the final model so I could trial and error out the design to be certain it would fit in place and clear the rolling stock. Which was no small challenge. 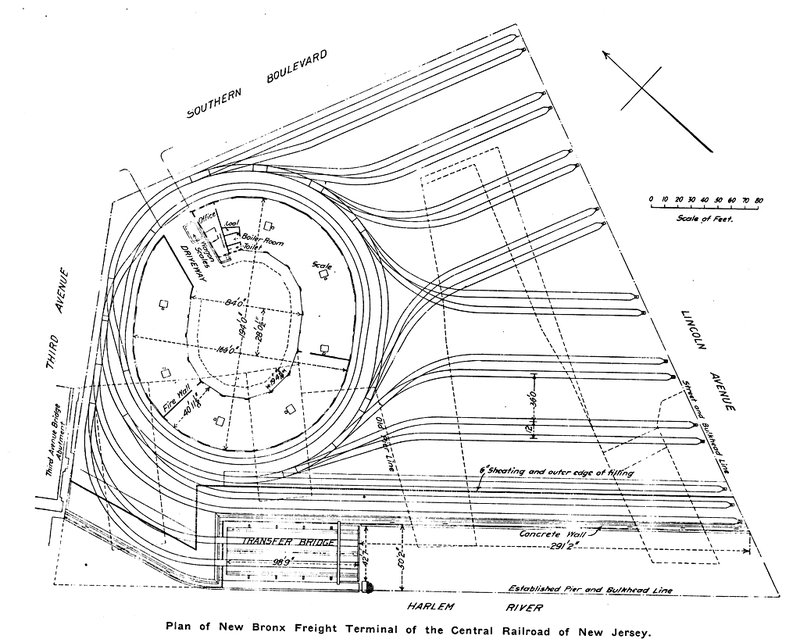 When I made up the initial CAD work for the trackwork, way back in 1999 I was just learning to use CAD systems. Unaware at the time, I made a bit of an error in the design. 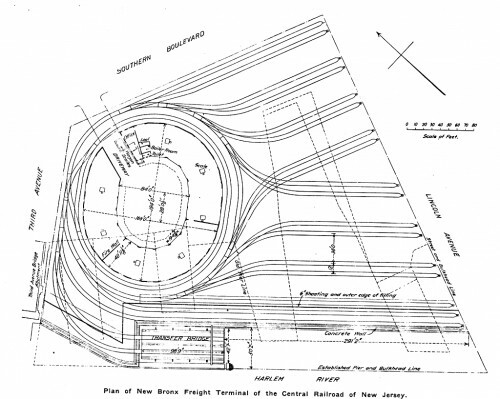 The straight portions of oval loops around the freight house were not parallel, they are off by about 2.5 degrees. I used that original CAD work done years earlier to make the test fixtures when I started playing with the idea of building the layout. I didn’t know then there was an issue in the design, and made all the fixtures and trackwork from that original flawed design. 2.5 degrees is not noticeable and the final trackwork looks and functions great. 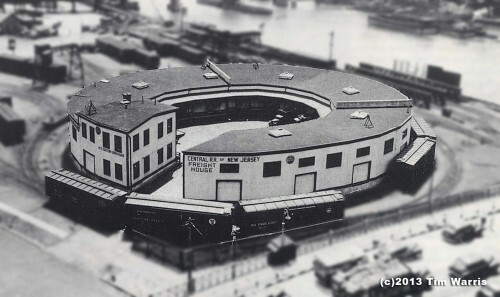 In 1907, “The Railroad Gazette” published plans and drawings on this nifty terminal recently built in The Bronx. 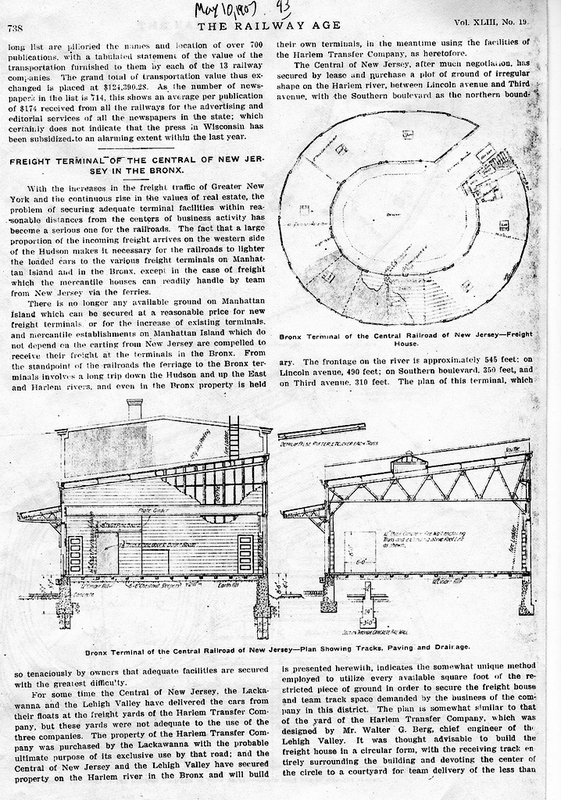 I was able to get a copy of this article and used it in the design on the first attempt at building the freight house. Since I was exuberantly confident that my CAD work was infallible, I dove right in and spent a few weekends building the freight house mock up. Once done I attempted to put it in place only to discover just how much 2.5 degrees really is. There was no way it would fit. It was too big at one end and too small at the other. 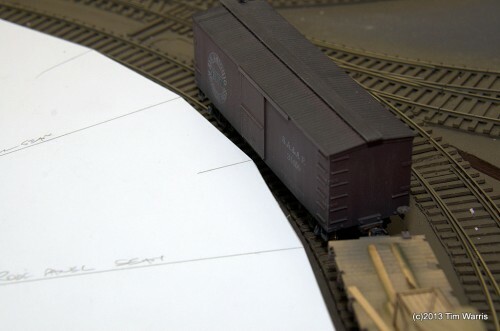 The straight sections were noticeably inaccurate and there was no way a string of freight cars could navigate their way around the building without hitting it. After an appropriate amount of swearing, I went back to the drawing board. I made a 3D SolidWorks CAD model of the freight house in 2009 and by that time I had a bit more skill with CAD work (about 10 solid years full time of it…) This model was a “parametric” version of the freight house, which simply means that instead of drawing a wall and adding a dimension to it that show the size of the wall, I made a model of the building with dimensions that drive the size of the walls. Simply changing the dimension would change the CAD model and update all the other relationships in the model. 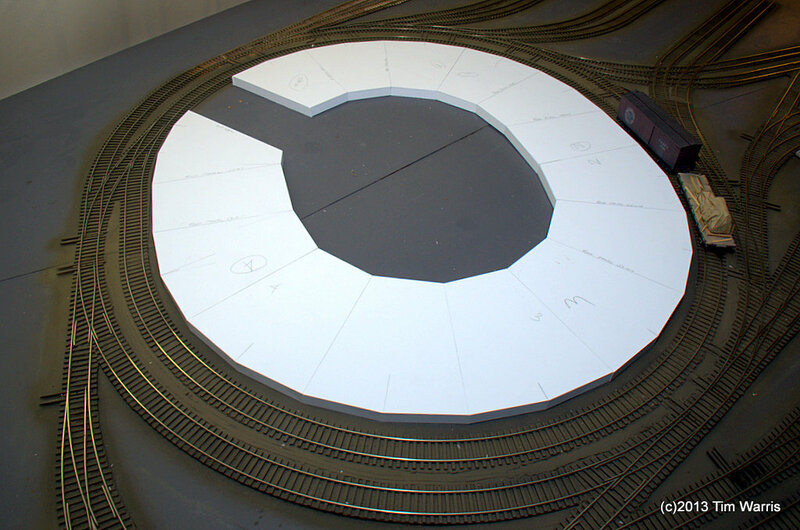 This would allow me to tweak each section of the 29 sided nightmare as necessary to get it to precisely fit inside my oddly shaped oval. To the naked eye, it is undetectable, but mathematically each section of the building is slightly different. Using the Fast Tracks laser cutter, I cut out all the sections and built the model, which fit perfectly (the third or fourth time). This is a computer generated rendering of the freight house mock up. Hard to see, but most of those sections are unique sizes. The freight house mock up in place on the layout at a train show. It served me well for quite a few years, but its finally time to get the real model built! 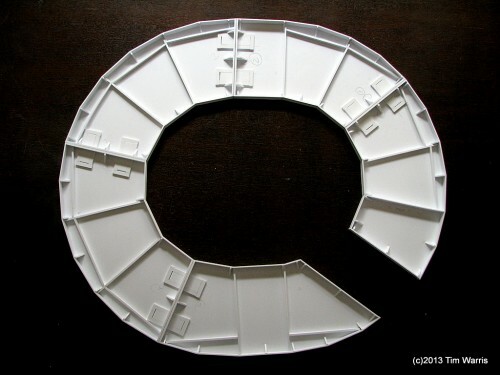 This model will be built from styrene, using traditional modelling techniques. That statement might be a bit of a surprise from those who have been following the CNJ Bronx Terminal project from the beginning. I tend to use a lot of technology in my modeling, mainly because I have easy access to it. The entire layout was designed using a parametric CAD system, a complete model of the layout exists digitally. 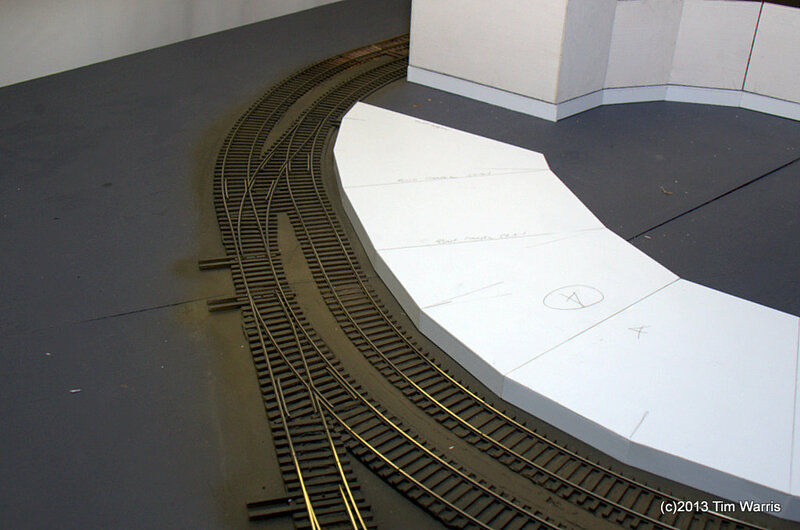 The road bed was cut using Fast Tracks laser cutter. All the benchwork was cut on a CNC router using files extracted from that parametric 3D CAD work. The engine house was designed in 3D, and completely cut out on the laser cutter. All the PC board ties were produced on a CNC milling machine. 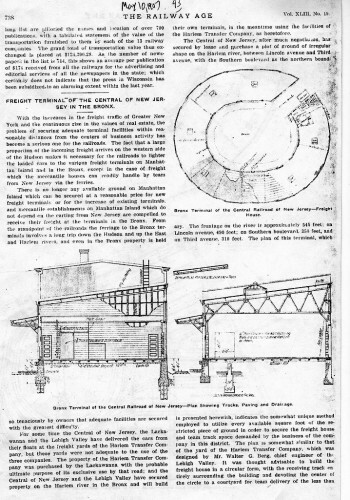 The trackwork was built in custom designed Fast Tracks fixtures. The involvement of technology in this project is extensive. 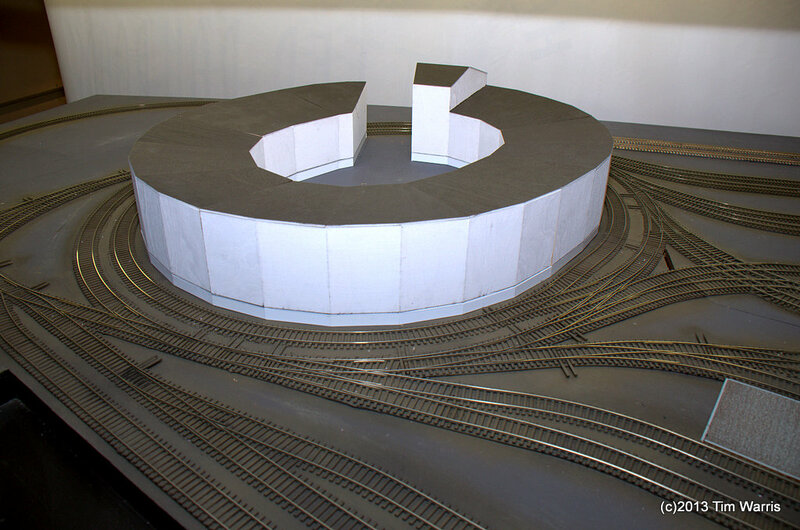 The mock up of the freight house was also cut out on the laser. All along I had intended on designing a detailed model in 3D of the freight house and using the laser to produce all the parts for it. And this intention delayed the project for years. One needs to remember that my day job, at Fast Tracks, involves about 90% of my time being spent in front of a pair of flat screen monitors doing CAD or design work of some sort. All day, every day, for the last 10 years. Every time I turned to the freight house project, the first step was to do more CAD or design work, and I just don’t have it in me. After a long day, or week, of CAD work, the prospect of doing more just didn’t seem that appealing. So the project would get set aside until the next time I thought I would do some work on it, usually with the same result. To get around this issue, I decided to toss the technology for the most part, and build the model by hand. The amount of time and effort will be about the same, but what I will be spending my time on will be more enjoyable for me. People tend to gush over the technology available to modelers such as laser cutters or 3D printers, overlooking the fact that they don’t really do anything. One must spend a lot of tedious effort to produce the necessary CAD files for these. And those files need to be extremely precise, otherwise all that nifty technology will let you down when you go to put something together. Instead of spending 10% of your time in research and design with 90% modeling, you spend 90% of the time on design and the rest modeling. These nifty machines are not the panacea they appear to be, much to the disappointment of the cheering masses of modelers out there who can’t wait for them to become cheap enough for everyone to own. But I digress…. 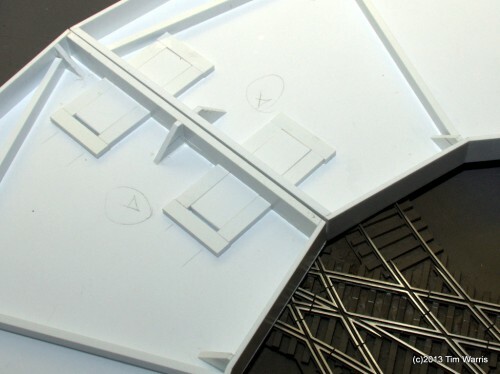 Using the laser cut mock up I had made a few years back as a template, the foundation was framed up using styrene sheet stock and dimensional strips from Evergreen. If you look close, you might be able to spot the subtle differences between the sections of the building to get it to fit in between the oddly shaped oval trackwork. 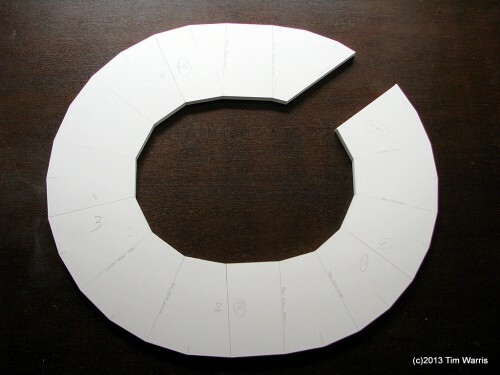 The most visible are the small straight sections of the oval, instead of being rectangular, they are more of a trapezoid. This shape allows one end of the structure to be slightly larger than the other. The mock up was built in five sections, so I can easily take it apart to transport. 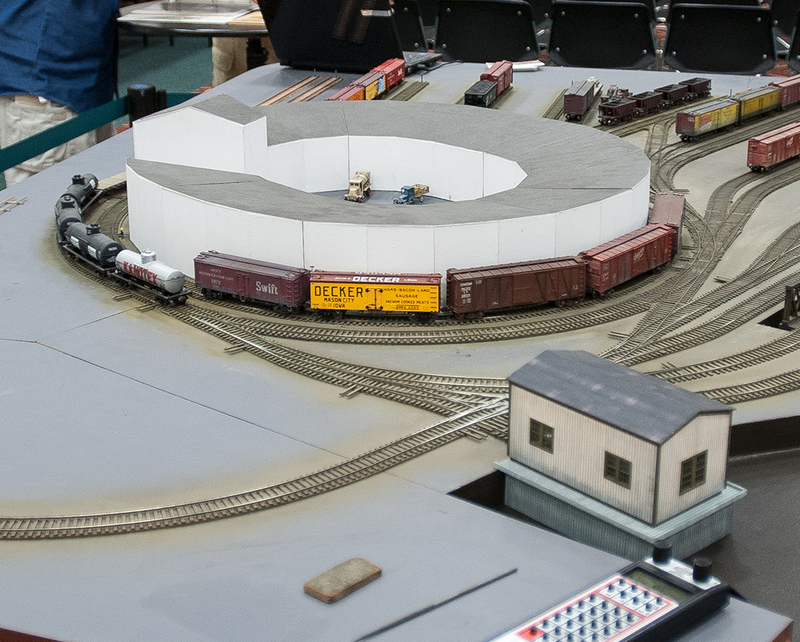 This model is quite large, about 26″ across, so a single piece would be quite unruly to move around. Remember, this entire layout is portable, designed to be fit inside a mini-van to take to shows. The sections can be seen on the bottom view of the foundation. 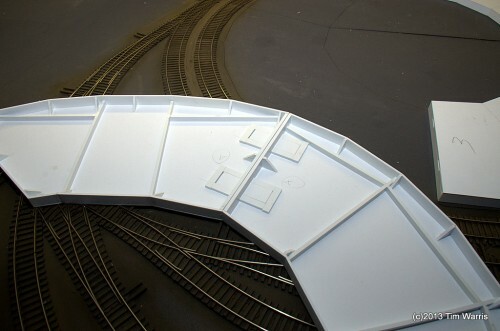 Simple joiners are used to connect them together, similar to how the sections of the layout work, except those are aluminum. The mock up of the freight house sitting on the foundation. It is exactly the same size. 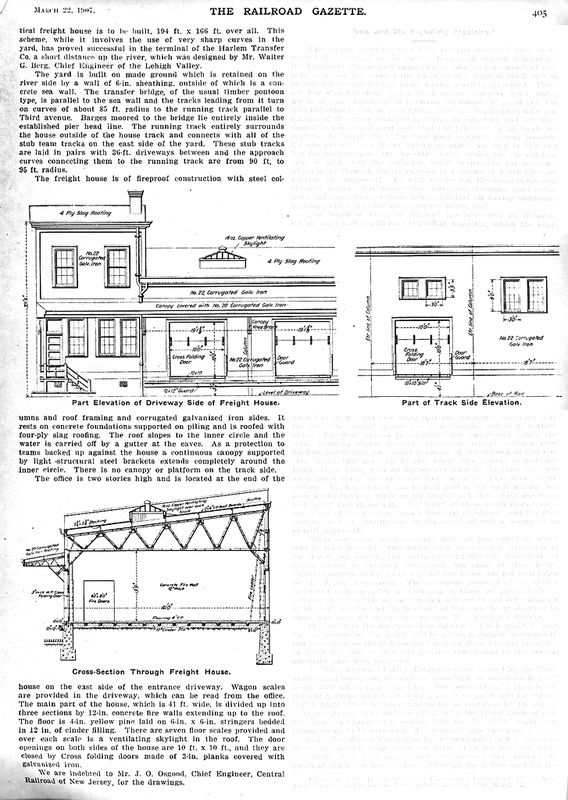 The office and one section of the freight house sitting on the foundation. There is a consistent space between the track and the edge of the foundation. 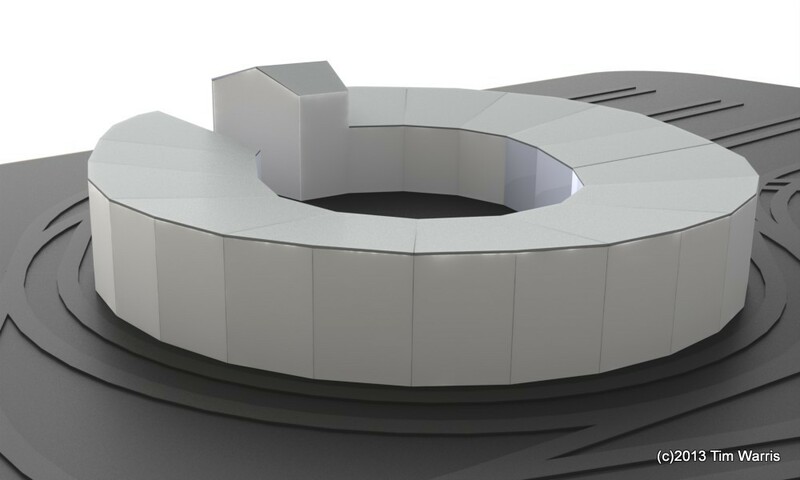 Getting this right with the final model is easy since the mock up was built to confirm everything would function correctly before the final model build. Getting the mock up right was no small feat! Testing with some cars. This is a 36′ boxcar and flat car, but it works fine with 40′ as well. Even a 50′ will make its way around the structure without interference, but just barely. Just like the prototype did! Close up detail of the simple styrene joiners to keep the foundation aligned and flat. With the foundation complete, next up, walls! Hopefully I can do Larry Fishers version of the freight house justice!